There's plenty to do at Emory in the final weeks leading up to Commencement and the end of the academic year. Check out these 10 options ranging from entertaining to enlightening, all costing $10 or less. 2. Enjoy the spring beauty of Lullwater Preserve. 3. Understand world hunger at the Oxfam Hunger Banquet. Expect to be enlightened April 8 as Catholic Relief Services hosts the Oxfam Hunger Banquet. Gather for a free meal at 6 p.m. in Winship Ballroom of the Dobbs University Center. But to illustrate the hunger issues faced by much of the world's population, you won't know what meal you are going to get until you draw a ticket at the event. Some participants lucky enough to draw tickets representing developed countries will enjoy a full meal of all they can eat; those representing the poorest countries will dine on little more than rice and water. Either way, you'll experience meaningful discussion and a new perspective. 4. Experience the musical talents of Emory students. The Emory Chamber Ensembles perform on Sunday, April 10, at 4 p.m. and 7 p.m. in the Schwartz Center for Performing Arts. The two concerts are free. On Thursday, April 14, at 8 p.m. in the Schwartz Center for Performing Arts, the Emory Dance Company performs a new choreography showcase under the direction of George Staib titled "Undertow." Other performance dates include April 15 and 16. Tickets are on sale now. On Saturday, April 16, at 8 p.m. in the Schwartz Center for Performing Arts, the Emory University Symphony Orchestra partners with the Emory University Chorus for a free performance of Maurice Duruflé's "Requiem." On Tuesday, April 19, at 8 p.m., the Emory Big Band performs a free jazz concert in the Schwartz Center for Performing Arts. The Emory Wind Ensemble performs "From the Americas," featuring works from the United States, Latin America and South America, on Thursday, April 21, at 8 p.m. in the Schwartz Center for Performing Arts. Emory vocal students present opera and musical theater scenes for "Stageworks 2016" on April 23 at 8 p.m. in the Performing Arts Studio. Capping off the month is a free Emory Concert Choir performance on Sunday, April 24, at 7 p.m. in the Schwartz Center for Performing Arts. 5. Travel back in time in Atlanta. The city of Atlanta grew rapidly during the second half of the 20th century. A new exhibit at the Robert W. Woodruff Library, called "Changing Atlanta 1950-1999: The Challenges of a Growing Southern Metropolis," illustrates how city leaders and citizens met those challenges. You can explore the free exhibit in the Schatten Gallery on Level 3 of the Woodruff Library, or learn more by attending a panel discussion on April 12. "Changing Atlanta: Politics and Civic Engagement," will be held at 6:30 p.m. in the Jones Room at the Woodruff Library, featuring three of the exhibit's curators. 6. Take your favorite little ones to hear "Artful Stories." Looking for a fun Saturday activity to share with the kids in your life? Head to the Michael C. Carlos Museum for Artful Stories for Families. On Saturday, April 16, at 10 a.m., kids ages 3-5 will gather in front of the Tibetan shrine to hear "I Once Was a Monkey: Stories Buddha Told," then make their own block prints of the animals featured in the stories. The program is free, but reservations are required. 7. Join a block party to say "thank you" to the Wagners. After more than a decade as Emory's president, James Wagner announced in September that he will step down at the end of August 2016. On April 21, Emory faculty, students and staff will come together for a block party to thank President Wagner and his wife, Debbie, for their service to the University. The lunch gathering in Asbury Circle is set for 11:30 a.m. to 1 p.m. with music and free hot dogs, chips, ice cream and Coca-Cola beverages. At the block party, well-wishers can bid goodbye to the Wagners in person and leave written messages on cards that will be assembled into a guest book. 8. Celebrate Shakespeare on the 400th anniversary of his death. In November, Emory will serve as the only host site in Georgia for "First Folio: The Book that Gave Us Shakespeare." Shakespeare at Emory celebrates the selection with a variety of lead-up activities. On April 23, Theater Emory hosts the Shakespeare Anniversary Celebration at various locations in and around the Schwartz Center for Performing Arts, inviting students and faculty, local artists, and community members to join together for a 12-hour tribute featuring performances, conversations, and festive gatherings, marking the 400th anniversary of the Bard's death in 1616. The revelry begins at noon and ends with a midnight ritual inviting all attendees to honor the life and art of Shakespeare. Events include a large-scale battle scene, high tea, performances and "comic diversions from a fool or two." The celebration is free and open to the public. 9. Visit the Michael C. Carlos Museum. If you missed it during Tibet Week, visit the Carlos Museum for "Doorway to an Enlightened World," a spectacular shrine exhibit featuring items from the Alice S. Kandell Collection. While you're there, take time to visit the permanent collections and other temporary exhibits. 10. Help tend one of Emory's community gardens. Emory's Oxford College campus features the Oxford Farm — a full organic farm growing a variety of produce served in campus dining halls and available through the Emory Farmers Market and a CSA. Sign up for a volunteer shift. 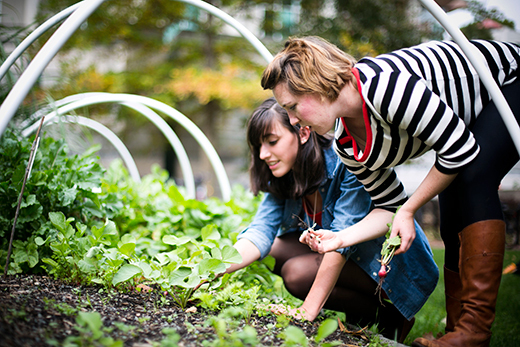 On Emory's Atlanta campus, five educational gardens grow a variety of vegetables and fruits with help from student, faculty and staff volunteers — and those who donate their time often leave with fresh produce to enjoy. Gardens are located near the School of Medicine, Rollins School of Public Health, Candler School of Theology, Emory University Hospital, The Depot, and on Asbury Circle at the intersection of the Cox Hall Bridge. If you would like to volunteer, email gardens@emory.edu to be added to the Listserv.